CBS Sports continues its tradition of introducing innovation and technology to the sports broadcasting industry at the Super Bowl. 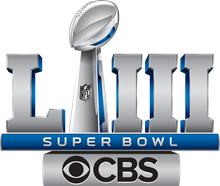 CBS Sports will give viewers coverage of Super Bowl LIII on February 3 from Atlanta with its use of virtual augmented reality graphics, 115 cameras including, for the first time ever on any network in the United States, multiple 8K cameras, as well as 16 cameras with 4K capabilities. For the first time ever on any network at a live sporting event, CBS’ Super Bowl LIII virtual plan includes the use of a live, wireless handheld camera showing augmented reality graphics, and up-close camera tracking on the field. This will allow the camera to get closer to these virtual graphics in a way that gives viewers different perspectives and angles including never before seen field-level views of these graphics. CBS will utilize four cameras (including the SkyCam) with live augmented reality graphics, plus an additional 10 cameras with trackable first down line technology. In all, 14 cameras creating virtual graphic elements that are completely manufactured will seamlessly blend into the real environment of the broadcast. For the first time ever on any network in the United States, CBS will use multiple 8K cameras with a unique, highly-constructed engineering solution to provide viewers with even more dramatic close-up views of the action from the endzone including possible game-changing plays along the goal lines and end lines. Also for the first time ever on any network, CBS will deploy 16 cameras with 4K capabilities, as well as nine Sony 4800 camera systems strategically placed around the stadium. The cameras will provide additional live game camera angles, and give the production the ability to replay key moments of the game in a super slo-motion and an HD cut-out with zoomed-in perspectives with minimal resolution loss. Viewers will see dramatic plays from every angle as every square inch of the endzones will have multiple camera angles providing coverage. Over 25 cameras will flank each endzone including HD cameras with super slo-motion capabilities, six 4K cameras, three-goal post super slo-motion cameras shooting the backlines, and 14 cameras embedded in pylons per each side of the field. A total of 28 pylon cameras will be a part of the 50-plus camera feeds from the endzones.